Home / entertainment / Logitech G502 vs G602: Which One Is The Best? 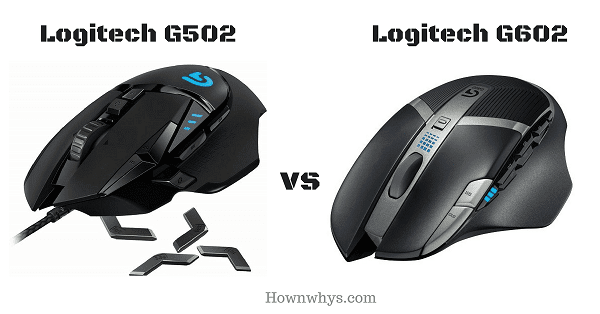 Logitech G502 vs G602: Which One Is The Best? Logitech G602 and G502 are two most popular gaming mice, famous across all best players around the globe. But which is the best among both of them? 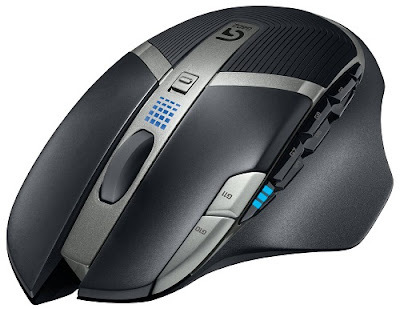 Is 2016 launched G502 better than 2013 fame G602 or vice versa? When deciding upon the best gaming mouse, one must compare each requirement individually. This helps in better understanding of what the product offers and what is actually required. Every FPS gamer has its own gaming ways and different expectations from the peripherals they use. Some may like the mouse hefty while others want it to be as light as possible. Similarly, the shape and design of the mouse affect the gamers largely as some would have palm grip and others don't, some would prefer small-sized while the ones with larger palm would want to go with larger dimensions. Therefore here we will compare each specification solely in order to give you the real picture of which is best for you and which is not. 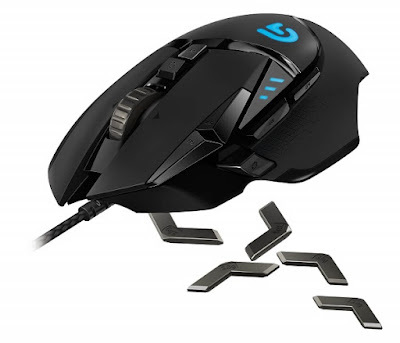 Logitech launched a gaming mouse that can fulfill the requirements of all types of gamers and so it introduced G502 Proteus Core. This mouse has 11 programmable buttons on it that can be mapped as per your usage and habit. An additional feature of G502 is the LED light on its top which you can customize according to your style and environment. The grey-blue colored mouse comes with a gaming software through which you can control surface tuning, button macros and customize lighting. Launched in August 2013, G602 spread like a forest fire! A wireless gaming mouse with 11 programmable gaming buttons on it. Its wireless range is up to 10 feet or 3 meters and uses a micro USB 3.0 which fits well on your PC or Laptop without acquiring any additional space. The best feature of G602 is the dual mode battery. You can choose from Endurance and Performance mode. For optimal gaming, you choose Performance mode and for conserving battery life Endurance mode. The LED just above the middle switch lights up blue for former mode and green for latter. Also Read: Nikon D3400 vs Nikon D3300 - Which is the best DSLR for you? The top-notch G502 comes with 11 programmable buttons arranges in a very smart layout. It has a left mouse button, a right mouse button, a scroll wheel that clicks in three directions, two DPI sensitivity buttons near the top, one button below the scroll wheel and three thumb buttons. These buttons can be mapped asper your needs with the help of the logitech gaming software. There is also a non-programmable button beneath the scroll wheel to adjust the wheel's friction. Unlike other Logitech gaming mice, the G502's scroll becomes rock solid upon pressing the button. Though the free scrolling mode is still available. The G602 too have a count of 11 buttons, including left and right clickers, a performance mode switcher, up and down DPI toggles, six re-programmable side buttons, and the scroll wheel. The control of the buttons can be customized to some extent through the gaming software. It does not offer you the scroll buttons, as in the G502 Proteus Core, which are quite important for giving the scroll additional resistance while playing. Therefore G502 wins in the buttons layout challenge. Also Read: Polaroid Zip vs HP Sprocket - Which one should you buy? The mouse ranges from 200 up to an unprecedented 12000. You can adjust the DPI modes on the fly and choose from among five settings. This is something the users won't find in any other gaming mouse. Although, the 12000 DPI settings is far too sensitive to be of much use. The DPI buttons located next to the left mouse button are large enough to press easily without looking and are useful for first-person shooters. The mouse includes programmable DPI switching buttons on the left click button for fast, accurate trigger-finger control and offers five DPI setting per profile from 250 DPI up to 2500 DPI. The DPI in G602 is sufficient enough to fulfill your fast maneuvers yet is too low as compared to that offered by G502. Therefore G502 wins the DPI challenge. This mouse has a tunable weight system which means you can adjust the weight of the mouse as per your needs. This gives you an additional feature of customizing the mass of your mouse. You get five weights of 3.8 grams each for a personalized feel and better performance. G602 scales at a hefty 152 grams and doesn't come with a tunable weight system. The majority of its weight comes from the two AA batteries powering it. Most gaming devices weigh between 90-130 grams which makes G602 quite heavier than others. The weight makes it duller and puts a lot more strain on the wrist which is not a good thing. Hence G502 wins the weight challenge with its advanced tunable weight system. The Proteus Spectrum includes Pixart's PMW3366 optical sensor. This is considered as the best and most responsive optical sensor. This offers maximum tracking accuracy when bundled with the high DPI. It precisely translates hand movements on screen. It also has the Logitech-G Delta Zero Optical Sensor that minimizes mouse acceleration and increases reliable targeting. The G602 uses Delta Zero Sensor technology which provides smooth tracking of all types of surfaces. This technology is present in all new gaming mouses by Logitech. Through this sensor, you are able to move the mouse on almost any surface quite easily. But G602 lacks the PMW3366 optical sensor. Therefore improved G502 wins the sensor challenge. The G502 was launched at a retail price of $79.99 but now you can buy it on Amazon at a price of only $49.99 which is quite low as compared to other gaming mouses with these amazing set of specifications. Logitech G602 could normally be found for $55 to $80 up until January 2017. Now it is at its lowest price of $40 on Amazon. This sounds like a good bargain for gamers who are seeking a rough and tough mouse with sleek design and affordable price. Other factors remaining constant, since G602 is cheaper than G502, it wins the price challenge. G502 is an optical mouse with braided cord wire which connects to a USB 2.0 port. This means no batteries at all. Now, this may be a good news for those who think batteries are an additional weight but bad news for those who don't like messy cords. The G602 is a wireless mouse with a range of up to 10 feet or 3 meters, therefore it requires 2 AA batteries which are non-rechargeable. But due to its dual performance mode, you will not need to change the battery for about 6 months. Considering the fact that batteries add up to the weight of the mouse making it hefty and straining the wrist, G502 wins the battery challenge because it works without batteries. Also Read: How to become a genius overnight? The G502 works well with Windows 10, Windows 8.1, Windows 8 and Windows 7. Its system requirement includes a USB 2.0 port. You also need an internet connection for an optional gaming software download. It has been argued many times and some people agree that G502 works with Mac OS to some extent but you will not be able to enjoy its feature the to the full extent in Mac. The G602 can connect to Windows 10, Windows 8, Windows 7, Windows Vista and Mac OS 10.6.8 or higher. It uses a USB 3.0 port to connect the wireless macro USB. It also requires internet for an optional software download. Clearly, G602 wins the System Requirements challenge as it works on both platforms, Windows and Mac OS. The above challenges are the ones which are essential to any gaming mouse and for a good gamer, each of the above-mentioned points matters a lot. The Logitech G502 is better than the older G602 in every respect and there is no doubt whatsoever. Its price is definitely worth the features it is offering. The only drawbacks of G502 include its small size because people with larger hands find difficulty in holding it and playing smoothly. And its inability to connect with Mac OS. The new surface tracking ability and tunable weight system are a brilliant addition to the G series mouses. Therefore if you are planning to buy a gaming mouse with excellent capabilities and comfort within an affordable price range then you must go for Logitech G502 Proteus Spectrum. What do you prefer? Share your choice in comments.